Every journey starts at the beginning, and where else with the restoration of a Williams Defender arcade machine to start with where, what, how and who (blame eBay). I’d been looking on and off for a Williams Defender cabinet in the UK for about the last 18 months as it’s always been an ambition to own one (since playing them very badly at the Wessex Super Bowl as a kid) and our new office had enough extra space and a team of people young enough to appreciate it the second time around. I’d picked up the pre-requisites for converting our existing mini-Jamma machine into a Defender cabinet – two Defender CPU boards from the US, a set of green Defender ROMs (from the US too), some spare RAM chips (from Sofia, Bulgaria no less, where apparently they still use them in some live machines!!) 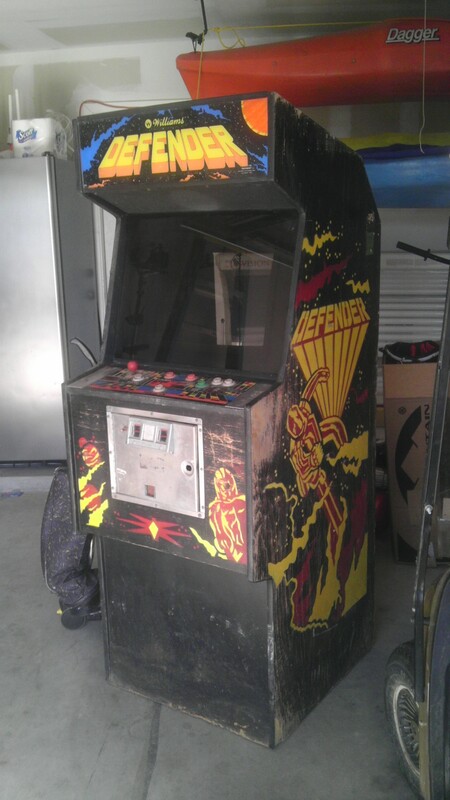 and a Joust CPU board and ROM set for good measures, but really wanted to get an original cabinet if I could. Came one night in December just back from Christmas festivities and probably still a little tired from enjoying oneself, 4 individual posts arrived on eBay for a Williams Defender CPU, ROM set, Power Supply and Multi I/O Adapter. Sounded to me like there might be a cabinet somewhere nearby if they were all being listed together (or someone who had amassed the pieces but then given up before making it work) – so I dropped them an email to ask if they did. A frantic 10 minutes later of “Buy It Now’s” on eBay and I’d get all the parts to seal the deal so sent a final email over before the nightly fox chasing with the dog. Print article This entry was posted by Judder on March 7, 2012 at 2:51 pm, and is filed under Williams Defender restoration. Follow any responses to this post through RSS 2.0. You can skip to the end and leave a response. Pinging is currently not allowed.